1 SECTION I: GENERAL INFORMATION POSITION DESCRIPTION WILLMAR PUBLIC SCHOOLS Position Title: Special Education Instructional/Data Coach Immediate Supervisor s Position Title: Assistant Director of Special Education Job Summary: Department: Special Education FLSA Status: Eempt Under the direction of the Assistant Director of Special Education and/or the guidance of the Building Principal, the Instructional Coach facilitates change in instructional practices of teachers that will enable teachers to diagnose student s needs more analytically; plan more productively, and teach more effectively. SECTION II: ESSENTIAL DUTIES AND RESPONSIBILITIES 1. Coach staff in designing and implementing instructional activities and assessments to increase and measure student achievement a) Respond to instruction and programming needs of teachers, administrators and support staff. b) Assist teachers with progress monitoring for current initiatives including but not limited to: L.L.I., AIMS Web, AVMR, Student Success Teams, Student Assessment Teams, c) Serves as resource person and coach for staff to implement teaching techniques and classroom strategies to accommodate various student learning styles. d) Demonstrates best practices models and strategies for teachers in the classroom setting and provide support and follow-up discussions. e) Review IEPs for move-in students with disabilities to distribute to the Special Education Assessment team for appropriate placement. f) Provides guidance for classroom needs and purchasing requests. g) Facilitate the use of assistive technology to access curriculum and increase student achievement. h) Assist with preparation for local and state assessments. i) Assist with planning etended school year and summer school programming. 2. Provide individual and/or group instructional coaching and mentoring to teachers to improve classroom instruction for all learners. 3. Act as liaison between teachers, administrators, parents, community agencies, and private schools. 4. Work with teachers and administration to analyze student data, diagnose instructional needs, and identify research-based instructional strategies to close achievement gaps. 5. Monitor programs and services for quality and compliance with IDEA regulations a) Participate (as needed) in IEP staffings, annual reviews, and manifestations. b) Ensure that procedures are aligned with state and federal requirements. 6. Provide job-embedded professional development for teachers through modeling engaging, standards-based teaching as needed. 7. 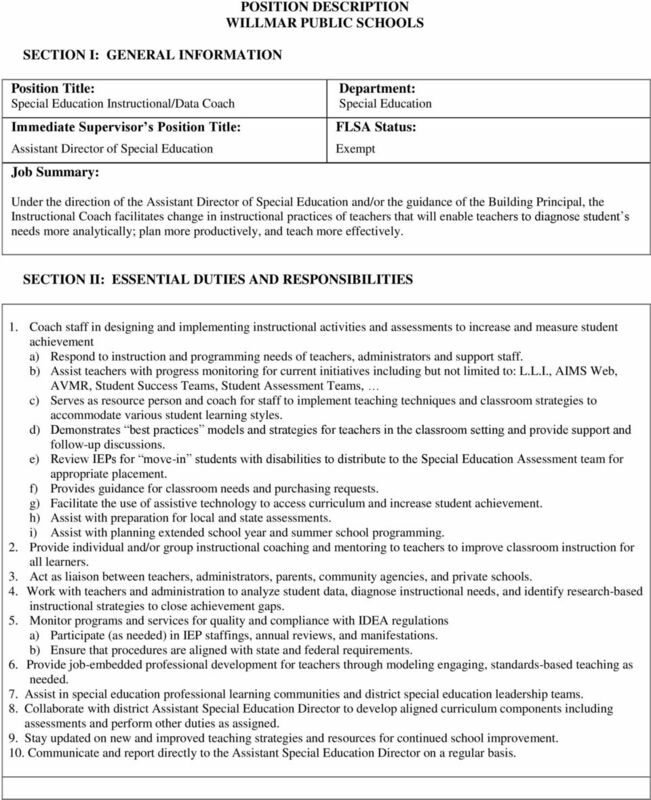 Assist in special education professional learning communities and district special education leadership teams. 8. 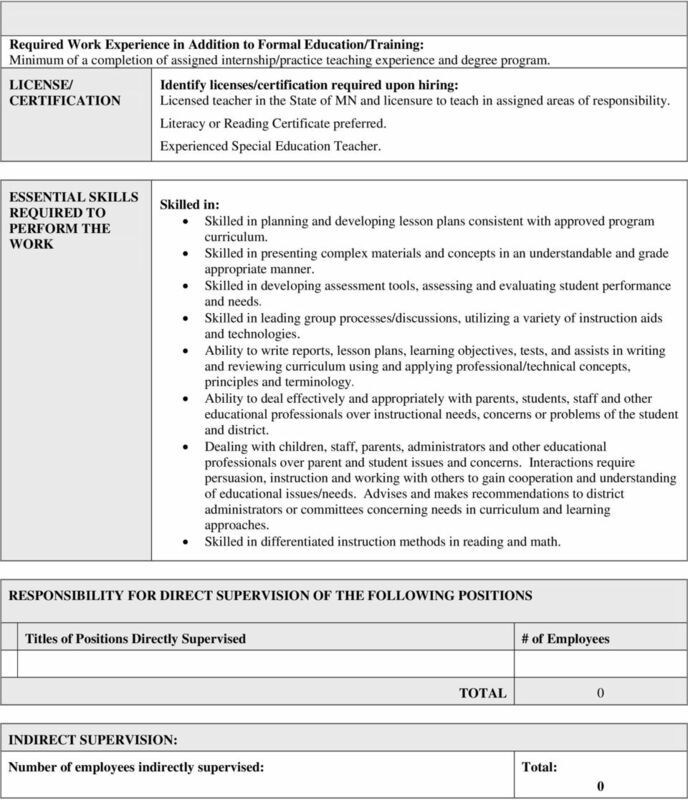 Collaborate with district Assistant Special Education Director to develop aligned curriculum components including assessments and perform other duties as assigned. 9. Stay updated on new and improved teaching strategies and resources for continued school improvement. 10. Communicate and report directly to the Assistant Special Education Director on a regular basis. 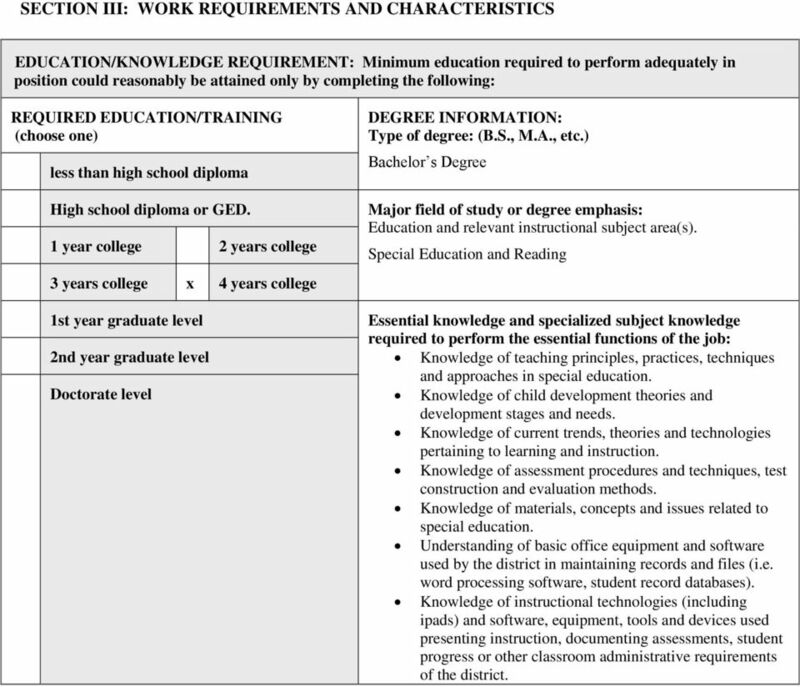 2 SECTION III: WORK REQUIREMENTS AND CHARACTERISTICS EDUCATION/KNOWLEDGE REQUIREMENT: Minimum education required to perform adequately in position could reasonably be attained only by completing the following: REQUIRED EDUCATION/TRAINING (choose one) less than high school diploma High school diploma or GED. 1 year college 2 years college 3 years college 4 years college 1st year graduate level 2nd year graduate level Doctorate level DEGREE INFORMATION: Type of degree: (B.S., M.A., etc.) Bachelor s Degree Major field of study or degree emphasis: Education and relevant instructional subject area(s). Special Education and Reading Essential knowledge and specialized subject knowledge required to perform the essential functions of the job: Knowledge of teaching principles, practices, techniques and approaches in special education. Knowledge of child development theories and development stages and needs. Knowledge of current trends, theories and technologies pertaining to learning and instruction. Knowledge of assessment procedures and techniques, test construction and evaluation methods. Knowledge of materials, concepts and issues related to special education. Understanding of basic office equipment and software used by the district in maintaining records and files (i.e. word processing software, student record databases). Knowledge of instructional technologies (including ipads) and software, equipment, tools and devices used presenting instruction, documenting assessments, student progress or other classroom administrative requirements of the district. 4 HAZARDOUS WORKING CONDITIONS: The essential duties of the work are performed under various physical hazards or environmental conditions noted Unusual or hazardous working conditions related to performance of duties: Duties are generally performed in a typical classroom/school setting where there are minimal environmental hazards and risks. Employee(s) may be eposed occasionally to disagreeable conditions involving human/student/parental contact. PHYSICAL JOB REQUIREMENTS: Indicate according to essential duties/responsibilities Employee is required to: Never 1-33% Occasionally Stand 34-66% Frequently % Continuously Walk Sit Use hands deterously (use fingers to handle, feel) Reach with hands and arms Climb or balance Stoop/kneel/crouch or crawl Talk or hear Taste or smell Physical (Lift & carry): up to 10 pounds up to 25 pounds up to 50 pounds up to 75 pounds up to 100 pounds more than 100 pounds PHYSICAL JOB REQUIREMENTS: Indicate according to essential duties/responsibilities Physical requirements associated with the position can be best summarized as follows: Light Work: Eerting up to 20 pounds of force occasionally, and/or up to 10 pounds of force frequently, and/or negligible amount of force constantly to lift, carry, push, pull or otherwise move objects in the performance of the job. 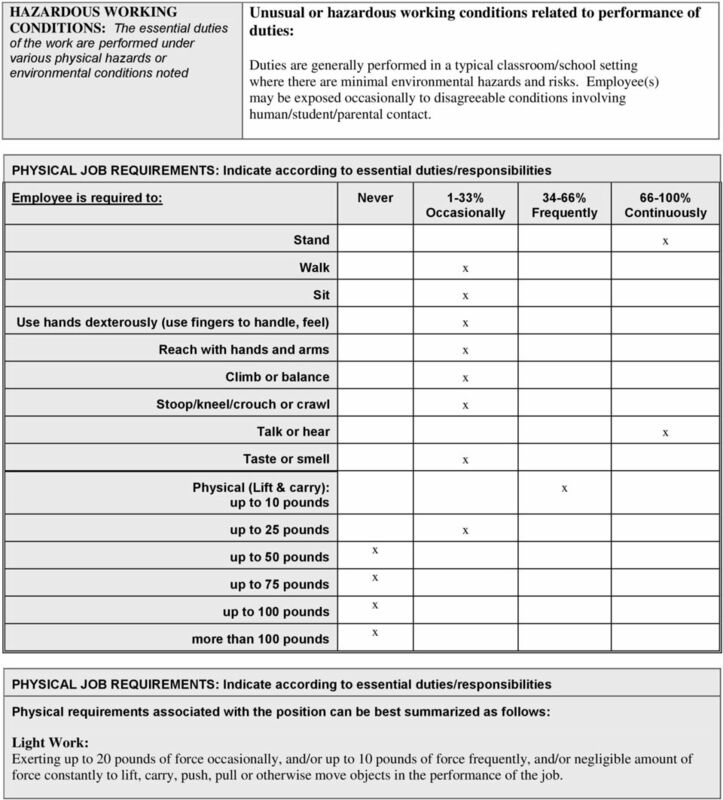 5 SECTION IV: CLASSIFICATION HISTORY AND APPROVAL This Position Description reflects an accurate and complete description of the duties and responsibilities assigned to the position. Department Head s Signature Date Classification History: Description created August D-6-2 (updated January 2015) Date Board Adopted: This description describes the general nature and work epected of an individual assigned to this position. Employees may be required to perform other job-related duties as requested by their supervisor. All requirements are subject to possible modification to reasonably accommodate individuals with a disability.